Rainwater harvesting is one of the oldest and most effective forms of water collection. It is also a key to decentralizing the water supply, removing a need to rely on the pool that can be cut off or contaminated. The average 25’x40′ roof is estimated to catch 600 gallons of water in one hour. 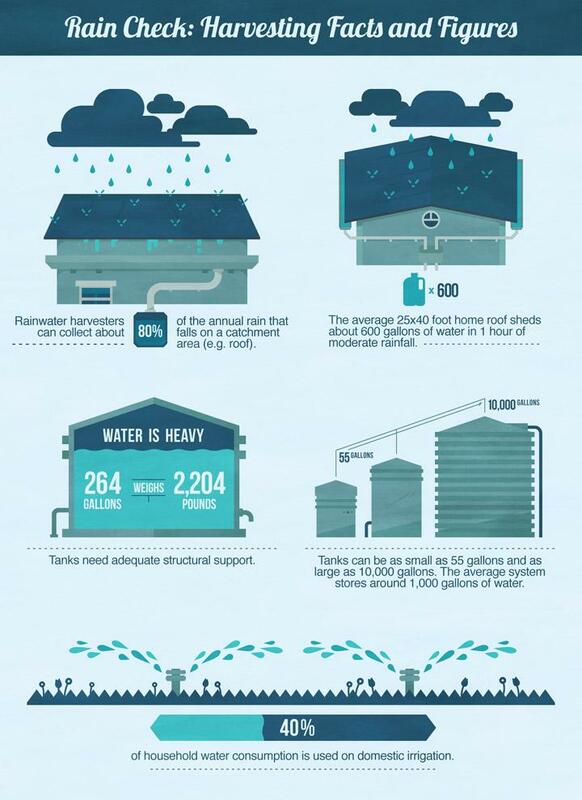 The process is simple: catch the rain on a roof and drain it into barrels, cisterns, or tanks. A wire mesh installed over the gutters and the collecting container prevents leaves and debris from falling in. It’s also possible to construct landscapes and structures in order to maximize the ability to store and utilize water in a productive way. The water can be used for any water purpose and, with treatment, can be consumed safely. Rainwater collection facilities can range from simple, like catching the water off your roof in tanks with spigots, to complex, like integrating it into a building’s plumbing. A great resource is a study about Harvesting Rainwater for Landscape Use by Patricia Waterfall and DIY forums on the subject.